STAMFORD, CT, USA, July 13, 2018 /EINPresswire.com/ — Celebrating 40 Years! 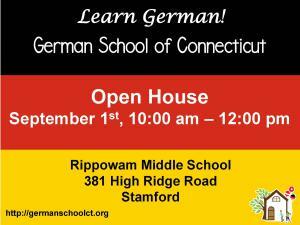 The Stamford campus is having an Open House on Saturday, September 1st from 10:00 am to 12:00 pm at the Rippowam Middle School located at 381 High Ridge Road in Stamford, CT. This event is open to the public. Registration information, teachers and school officials for new and continuing students will be available. Nothing connects us to a country more than its language. Speaking German can help you strengthen that connection while enhancing travel, education and business horizons. Established in 1978, the German School of Connecticut (GSC) – the only professional German Saturday School in CT – provides a high-quality German education program for over 350 children and adults. At GSC, students at all levels learn German language. The German School of Connecticut is a private, non-profit school with branches in Stamford and West Hartford, CT. The school was the first German language school in the United States to be selected by the State Department of the German Government to administer the official Sprachdiplom I and II examinations. These exams, which are a pre-requisite to university matriculation in Germany, test the equivalency of ten and twelve years of German language study. The German School of Connecticut receives support from the German government, as well as local businesses and donors. In 2009 the school became one of the 66 US Partner Schools with Germany. The school has a German-language library.